Fordell Firs Blog: Better late than never! Apologies for the delay in updating the blog recently - normal service has now been resumed after a few problems involving missing photographs, a missing memory card adaptor and a large toolbox being dropped onto an important network cable and severing the connection. Bob and Ali took a short trip down to Gosforth Park in Northumberland to promote the centre, and Scottish Scouting, at the Lookwide Marra 2008 camp which was held on the 23rd-26th May. This was a special activity camp to celebrate 100 years of Scouting in Northumberland, and shared its name with that of the original camp which had been originally held there by Baden Powell all those years ago. The camp was very well attended and featured a massive range of activities and events for all ages. The Fordell staff manned a promotional stand (this time using the Scottish Headquarters multimedia trailer) over the weekend and generated lots of interest, as can be seen in the photos. Lots of promotional material was handed out and hopefully this will lead to visits to Fordell in the future from a number of new groups. Above : Bob finally finds some people who haven't heard his 'Donkey and the well' story before. Meanwhile back at Camp Fordell, the rest of the staff were looking after the site under the guidance of assistant wardens Claire and Stevie. In Bob's absence, their duties included running the leaders' meeting, organising the activities for the weekend and telling the 'Donkey and the well' story at flagbreak on sunday to everyone who had heard it before anyway. Everything seemed to go very well, even though it was a hectic weekend, and all the groups went away happy again. The last couple of weekends have also been incredibly busy and well-supported by staff - with some pretty good weather thrown in too. The weekend of the 31st/1st saw us welcome two big scout groups from Ireland, one of whom had caught flights at 4am in order to come over! There was a great atmosphere on site and most of the groups on site attended a big campfire on the saturday evening - possibly not the best thing to have on a hot summer night but as soon as the sun disappeared most people were grateful for it. Above : Busy campfire full of Irish and Scottish groups. Above : Which one's the mop? 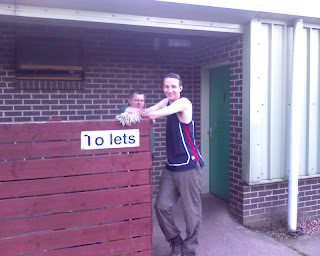 Bob and Callum waiting to clean the toilets.